The U.S. Army Corps of Engineers (USACE) operates 14 day-use parks around Lake Allatoona. Purchasing a Corps of Engineers’ Annual Park Pass might save you hundreds of dollars a year. There is a $5.00 per vehicle charge for day-use parks with beaches and a $5.00 boat launching fee for day-use parks with boat ramps. You can choose to pay the $5.00 per day to enter – or invest in an annual pass. A Corps of Engineers Annual Day Use Pass is $40 and is honored at Corps of Engineer’s day-use parks and boat launching ramps nationwide. Having the annual pass gives you the peace of mind to visit often … without worrying about spending a lot of time to make it worthwhile. The passes are valid for 12 months and available as hanging tags, which can be used in all your vehicles, or as a sticker, for use in Jeeps, convertibles and on motorcycles. Allatoona Lake Operations Project Management Office, Monday – Friday, 8:00 a.m. – 4:00 p.m. They accept check, money order and credit cards, but will not take cash. Many parks sell annual passes at their entrances. The day-use parks accept cash or check only. Several campgrounds will also take credit cards. 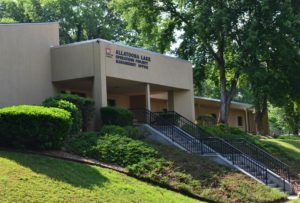 Allatoona Lake Operations Project Management Office, 1138 State Route 20 Spur, Cartersville, GA 30121. Call the Project Management Office at 678-721-6700 and pay by credit card.